Sticking to a food budget does not need to mean that you and your family eat baked beans every day and never buy any chocolate. Cooking tasty, healthy meals with food that you can afford is the responsible way to spend the money that you can afford to at the supermarket. It is far too easy to be tempted by all those buy one get one free offers that you just don’t need, or end up throwing away food because you have not planned your meals carefully. A recent survey estimated that Britons throw away one third of their groceries, which is a terrible waste of both money and resources that could be far better used elsewhere. Rather than throw away food or spend more than you can afford to, work out your food budget and make some plans to help you spend it wisely. The first thing you need to do is know what your food budget is. 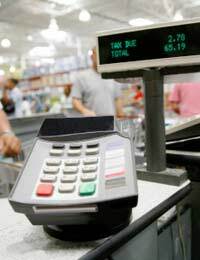 Work out your weekly and monthly incomings and outgoings and calculate an affordable amount for your shopping. If you have a set salary, you can be pretty accurate with this figure, if you are self employed or have a fluctuating salary, try to calculate an average month and accept that you may be flusher one month! Work out if your supermarket budget needs to include other products, too, such as cleaning items, toilet rolls, toiletries and so on. Once you have your budget you will be able to cross reference it with how many people you are feeding. A medium sized food budget can see rather small if you have four hungry male teenagers to feed! An important ingredient in sticking to your food budget is to plan your meals. You can’t just wander into the supermarket and pick up whatever you fancy and end up throwing it away because you forget your husband had booked a weekend away or that your sons had friends staying. It works well if you have a family diary so you know who is going to be around for supper each night. You may chose to have a simple poached egg on toast one night if you know you will have a night alone in front of the TV, or you could make a big batch of chilli if your family are coming over. Planning your meals also allows you to plan cooking with leftovers. Sausages with mash potatoes one night can make great fish cakes the next, if you make plenty of potatoes. A big Bolognese one night can be transformed into a chilli con carne the next by simply adding a couple of tins of beans (kidney beans and baked beans – try it, it really works!) and some chilli powder. Don’t go to the supermarket when you’re hungry – every thing seems tempting and it’s harder to stick to your budget. Make your money go further by shopping locally and seasonally – use a local greengrocer, butcher and fishmonger if you have them, or try your local market. Don’t buy something just because it’s on special offer – make sure it fits in with your budget and you actually need it (better for your waistline too as the offers are usually on unhealthy food). Make your own bread and cereal bars – far cheaper and tastier than supermarket versions and you get to feel all virtuous.